The friction match was invented in England in 1829. Soon thereafter, they were made of phosphorus tips. Prior to the use of matches, a tinderbox and materials were used to create a spark to ignite a fire, something very time consuming. On the other hand, the matches worked too easily, often causing accidental fires! 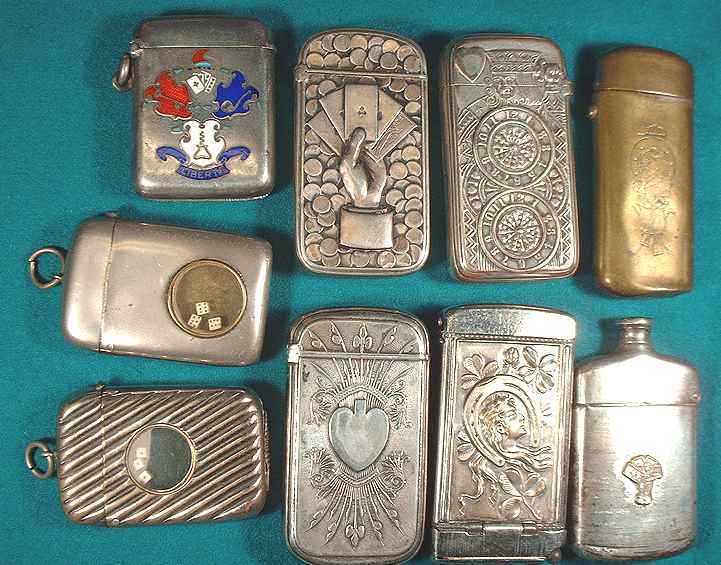 Therefore match safes were invented and became very popular. They protected the matches against accidental combustion and moisture. Many were quite opulent, like a jewelry accessory. Their use died out after 1892 when paper match books were invented, and especially after the 1920's when mechanical cigarette lighters were perfected. They make for a striking collection, though. 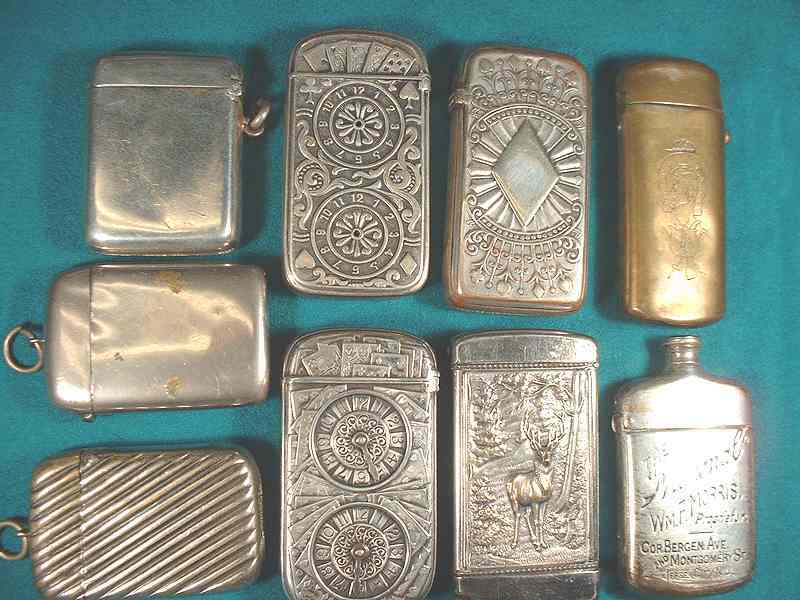 The match safes shown below are from my collection. Most are made of sterling silver. Many have makers' names. Both the front and backs are shown. .... ..... The two on the left have glass covered, sealed compartments to shake dice for an impromptu game. .... ....... The one at the lower right (see the second picture especially) is both figural (shaped like a liquor bottle and advertising (says "The National," Wm. F. Morris Proprietor, Cor. Bergen Ave., and Montgomery St., Jersey City NJ) ... ..... The brass one at the upper right has a jockey cap, good luck horseshoe, horse head and saddle .... ...... The most valuable ones are in the center, the three that have two whist scorers on one side. Note that on two of them, the moveable dials are missing.